Is your business prepared for 2019’s weather? 2018 isn’t a year that will be forgotten in a hurry; Brexit, England reaching the World Cup semi-finals, a Royal wedding and of course, remarkable weather. After the disruption the Beast from the East brought in March, the UK had to quickly adapt to scorching temperatures from April onwards. While many of us basked in glorious sunshine, the heatwave and drought weren’t welcomed by commuters, water suppliers or the fire and rescue service as wildfires spread across the country. Businesses can often find themselves slowing down or at a complete standstill during extreme weather. Fortunately, mobile messaging has proven time and time again that it can help keep things moving. 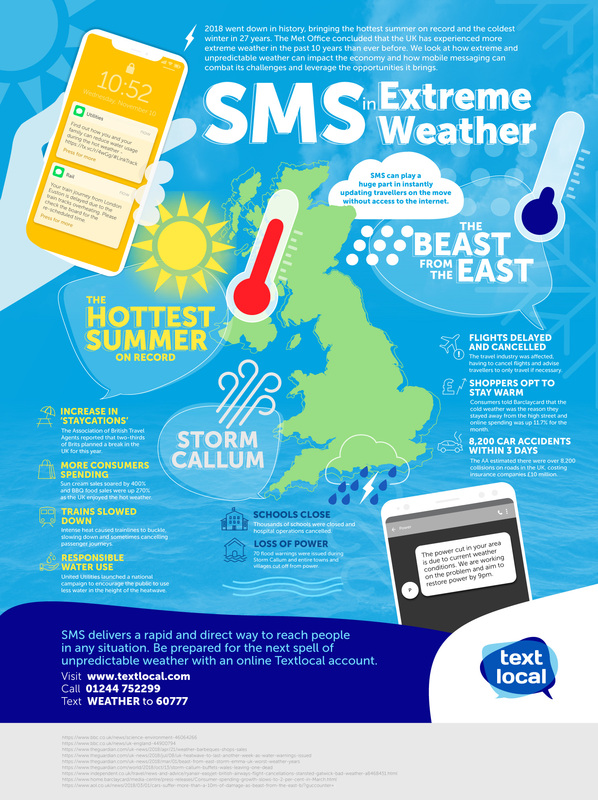 We were pleased to see so many businesses adopting SMS during 2018’s extreme weather; keeping customers informed on delays, cancellations and delivering safety advice messages, but what opportunities were missed by businesses? Extreme weather can buck the trend in holiday destinations and spending habits. In fact, two-thirds of Brits planned a holiday in the UK thanks to the heatwave. The way we shopped also shifted massively as online spending went up 11% when shoppers were reluctant to step outside in the cold throughout March. When this shift in consumer behaviour occurs, businesses can send a quick text message focusing on certain sales, products and offers that fit the new, albeit temporary mould. Snow-related SMS alerts are commonplace today, in fact many parents and teachers now rely on them as their go-to source of information, but what about when the weather’s so hot, local authorities need us to drastically change our habits? United Utilities launched a huge TV campaign mid-heatwave to make us consider the water we’re using ahead of what seemed an inevitable hosepipe ban. While fewer people were sat in front of the TV during the summer, their phones were never far away. A text message to residents on a Saturday afternoon to remind them not to overfill the kids paddling pool, or at bath time to suggest a shower instead could have driven an immediate change in water consumption. After the heatwave came the storms and in October Storm Callum generated 70 flood warnings, closed schools, delayed hospital operations and appointments and cut entire towns off from power. In addition to the obvious disruption, these conditions also brought a huge strain on contact centres dealing with insurance claims, cancelled travel and customers with no power. Keeping customers updated in real-time with SMS status updates reduces inbound calls and can increase customer satisfaction during an already challenging time. By installing our IMIChat solution into a contact centre, customer service staff can have multiple conversations across numerous messaging channels which instantly increases productivity and reaches customers via their preferred channel. If 2019 is a repeat of the extreme weather we experienced last year, how prepared is your business? Research from Towergate Insurance has found that 66% of SME’s lost revenue due to severe weather and nearly half of businesses (44%) have no plan in place to continue trading. Having an SMS platform in place alleviates this risk while giving businesses the chance to seize the opportunities that sudden weather brings.